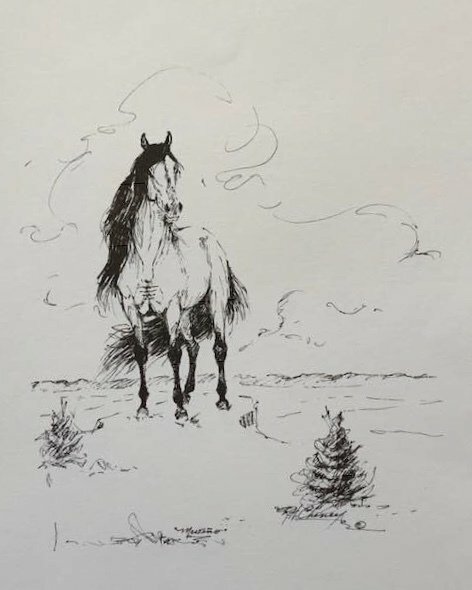 The artist, Rowland Cheney had a real reverence for Mesteño--the wild stallion who lived out his days as the band stallion of an enormous herd. In many ways, this stallion was the father of the Kiger breed. Rowland Cheney made many sketches of him. This image has been proudly used by KMA since the Association created the Kiger breed and is, in fact, the logo. This black and white print is reproduced on high grade paper and measure 11x14 inches with artists signature.